This large and beautiful tourist camera (24 x 30cm format) Is made from walnut wood. Was it truly manufactured by Lorillon? A plate indicates the coordinates of the manufacturer but is quite unusual compared to those we usually meet on Lorillon cameras. Do Lorillon was here only a retailer? It was common for a manufacturer to complete its own range by selling equipment from another source, the plate affixed maintaining ambiguity. 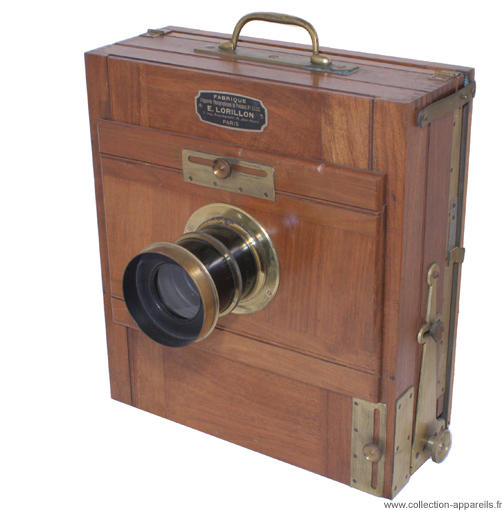 This camera is fitted with a portrait lens of German manufacture: Optische Institut München Droble portrait, 260 mm focal length and opening to 3.8. The square bellows is brown leather.